Who’d have thunk it? One tweet and I’ve connected with more writers than I have in the last two years on Facebook! I haven’t been very active on Twitter but I’ve found #WritingCommunity and I’ve connected with all sorts of creative, funny, supportive writers that I now follow. Some of them have been kind enough to follow me back. I’ve made a few friends. I also follow some folks like Joe Lansdale and Stephen King, who I’d never have a chance to interact with otherwise, right? This last week, a few of the more popular tweeters, ones with more followers, offered to retweet the tweets of those of us who have 1,000 or fewer (or 500 or less, it varied) to help us gain followers. With our names getting out there before all of their followers, it wasn’t long before our numbers were jumping. I decided to throw my name out there. By the way, I’m @SafranekLori on twitter. I started last week with around 175 followers. I’m not too active, so it’s my own fault I have so few. Today, I have 258 followers! And I’m following more than 300 people, most of them fellow writers. Other writers increased their following much faster. Networking at its simplest. So forget about the political arguments on Twitter. Hook up with the #WritingCommunity to talk about writing, stories of success and struggles, have discussions of why we write, and so much more. And make friends. I have found my people! Stories have been a staple in my life from the time I was a child. My dad told stories at the dinner table, in the living room when there wasn’t anything good to watch on television, driving down the road, at family gatherings — everywhere. My father’s family had a talent for spinning tales about their lives in the Ozark Mountains of southeastern Missouri during the 1940s through 1960s. Those stories traveled with them when they moved up to Nebraska, where I live now, and any time we got together, a story was told. Dad’s family was poor, the kind of poor where they lived on beans and cornbread most of the time, and the kids went without shoes in the summertime. Photos of them from that time resemble Dorothea Lange’s photos from the Depression Era, except they were taken ten to twenty years later when most of the country had improved its circumstances. My family was still in poverty. My grandfather was illiterate and times were hard. But they found humor in their lives and the stories were funny, uproarious even. How else could they cope with the dreariness of being so poor? As I grew up, our family in Nebraska got together for storytelling and I remember a lot of “hoopin’ and a’hollerin'”, which is what we call laughing and shouting. No story was too crazy to be believed, either. You didn’t need to back it up with facts, just “flour it up” with a few funny additions until we’re all rolling on the floor laughing. That’s all we ask. When my aunt and uncles and my dad got together, I swear the roof lifted off the top of our house, they were so loud. (That’s an example of “flouring it up”.) Each one talked louder than the other, trying to get to tell the story. We laughed until our sides hurt and our throats were sore. Somehow, he and his brother, Abe, (Yes, Gabe and Abe–I don’t make this stuff up, folks) and maybe their father, Homer, got their hands on some dynamite. They wanted to get rid of an old stump on their property. So they got the whole thing set up, dynamite ready. Someone warned them they were using too much powder for a little old stump, but pshaw! Grandpa scoffed. They knew what they were doing. So they set it off and POW! The dynamite went off, the stump flew into the air and soared right over my Grandpa’s house! Grandpa was watching, his eyes following the stump, and his head tilted back. As the stump arched, so did Grandpa. It went up, he leaned back, it flew over the house, he leaned farther. Suddenly, BAM! He landed flat of his back. My Grandpa was a cranky old man, and landing on his back was not at all funny to HIM. It was hilarious to his kids, who laughed themselves silly. And that’s how you turn a simple stump removal into a “story.” And EVERY time someone tells that story, we all laugh until tears fall. Those old stories are like favorite books to me. I ask my dad to tell me “the one about the time a tornado was coming and you all hid in the storm cellar,” or “about the time you came home from school and they had moved to a different house.” I have a lot of favorites, and Dad is always willing to tell me one. And that’s how the granddaughter of a man from the Ozarks found a love for telling stories. He never read a book in his life, but he and my grandmother, and their children passed along a huge appreciation of the art of storytelling to my generation. I sincerely doubt I can ever capture their flair for reliving a story, but they inspired me to write and I love them for it. 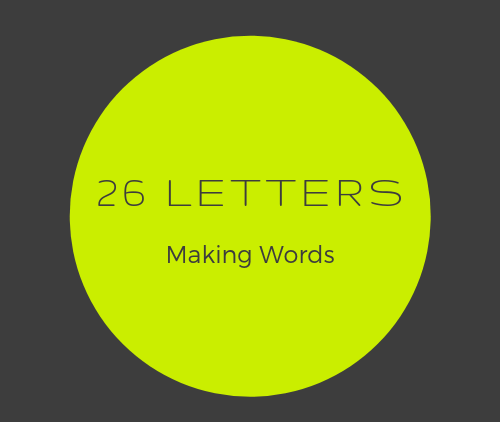 I named my blog 26 Letters, Making Words because one day I made the off-hand comment that all books start from just 26 letters, combined over and over to make different words. We can pretend to be linguistical geniuses, but it’s all sort of a big game of Boggle, and if you’re lucky and diligent and you paid attention in Miss Larsen’s Senior English class, you can probably write a pretty good piece of fiction. Those 26 letters I have at my disposal are the same 26 letters Edgar Allen Poe had, and that John Steinbeck had, and that Ray Bradbury had. And they each ended up with words and sentences that inspired me and made me want to write. Now I have to scoop up those letters and make words. Make the words into sentences. Sentences into paragraphs. You get the idea. Now I’m making words every day and I’ve finished the rough drafts of two novels. One is a romance novel and one is a horror novel. The romance novel started as a funny horror novel but it turned a corner somewhere and became a romance. The horror novel is still horror. That little switcheroo wasn’t my idea, but words don’t always do what you tell them to do. Sometimes they gang up on the writer and head off in their own direction. A plane ride becomes a road trip, or a walk down Lonely Street becomes a trip to the Las Vegas All-Nite Drive-Through Wedding Chapel. Words are fickle that way. And paragraphs? Don’t get me started on paragraphs. Those things will knock a writer right off the plot. Sometimes, they’re wise paragraphs and the change is good, but sometimes, the writer must be tough and throw those paragraphs in the trash. It’s only words, after all, just a bunch of letters. Don’t be too proud to mix ’em up or even throw them away.